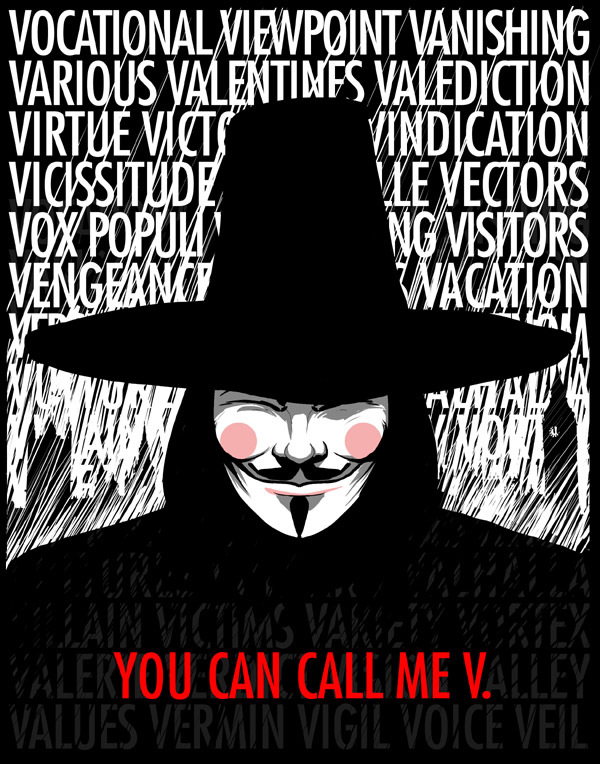 For anyone unaware yesterday was the fifth of November, a day which has gained some popularity since the movie V for Vendetta was released. In honor of that day I decided to watch V for Vendetta. The movie is based off of comic book/graphic novel by Alan Moore. I own V for Vendetta, however I have yet to actually finish it. I always get sidetracked, often by reading Batman instead. Regardless I don’t have any desire to compare it to the graphic novel. I’ve always enjoyed the movie, but I think it grows on me more and more with every viewing. I think that as I’ve aged I’ve started to grasp more aspects to the film since, if you want it to be, it can be quite deep. That’s one of the best aspects of this movie. It isn’t just an action film. Actually I wouldn’t really classify it as an action film. The movie has a great story that is well written and carried out. Along with that the dialogue is great. V is probably the first character that comes to mind with great dialogue, but really Sutler has some great rants and Prothero’s speeches are actually great as well. The performances go along side the writing in helping to cement how solid this film is. I have to start with Hugo Weaving as V. I suppose this maybe a spoiler to some, but V never takes his mask off (that you can actually see). His face is never revealed. That means Weaving spends the entire movie with that mask on. A mask that has a very specific set of facial features permanently glued on. Weaving does an amazing job here expressing V even though you don’t see his face. A lot of it has to do with has voice acting, but he also does a great job physically at helping to give the character some life. It really is a performance that probably get’s overlooked because of the genre and that he is wearing a mask. The supporting cast is great though. Again, John Hurt’s head as Sutler is great. He does a wonderful job giving raving rants and Stephen Rea does a good job with Finch. Natalie Portman wasn’t bad and I was actually a bit disappointed in Stephen Fry’s appearance. His character seemed quite a bit like the man himself and I kind of wish more of that would have come through. The movie does have some action to it, though I don’t feel like it’s that much really. What there is though is great. It’s wonderfully shot, as is the whole movie. I love films like this that are dark, because I feel like its easy to screw them up. There are plenty of movies that just use poor lighting and leave it at that. V however just looks very sleek and as dark as things are, you can actually see the details in the set. V for Vendetta is a surprisingly excellent movie that is likely to get snubbed by people because of the genre it’s thrown in, which is a shame. I feel like the movie probably would appeal to a pretty wide audience assuming they sit down and watch it. I also feel like a lot of the themes of the movie are actually pretty prevalent in our current day. Defiantly a movie to watch and own. ~As a final side note to the movie’s impact on our culture just look to the quote at the beginning of the post or how popular the Guy Fawkes mask for the movie has become since its release. Posted on November 6, 2011, in Action, Drama, Movies, Reviews, Sci-Fi, Thriller, Uncategorized. Bookmark the permalink. Leave a comment.